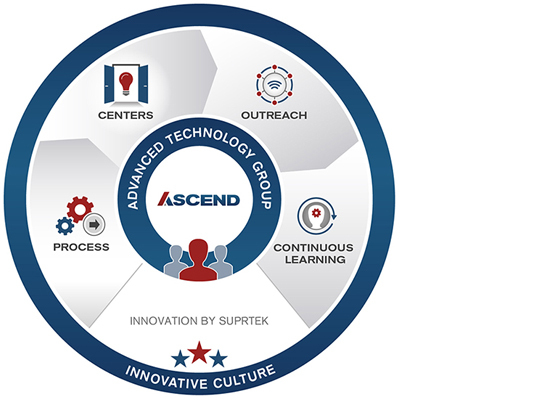 ASCEND, SuprTEK’s innovation process, is built upon six critically important, comprehensive components: people, process, centers, outreach, continuous learning and culture. SuprTEK consistently seeks ways to be innovative throughout our organization, including partner outreach, employee training and process adoption to improve innovation and innovation execution. Our innovation framework allows us to create high-impact solutions, working in close partnership with Government, Industry and Academia. Together, we will explore the infinite possibilities of advanced technology as it guides us all to achieve through innovation. The Advanced Technology Group (ATG), consisting of our highly-specialized technology experts, applies collective knowledge and experience to the innovation process. By continually tracking and applying emerging trends, our team is able to quickly and efficiently learn, adapt, create and deliver forward-thinking, breakthrough solutions with reduced investment risk. ASCEND’s integrated process design starts with a clear understanding of our customers’ problems and challenges. From within a collaborative and unconstrained environment, our seasoned team of technical experts, using their expansive subject matter expertise, execute a series of deliberate decision-making processes that fully-scrutinize, evaluate, and deliver innovative technology solutions. SuprTEK’s innovation centers enable and perpetuate a “Minds-on / Hands-on” employee philosophy. Our dedicated technology centers support employee research, development, implementation, and evaluation of innovative solutions. We invite partners and universities to work collaboratively in the Innovation Centers to foster cross collaboration of ideas and solutions. Our ASCEND Outreach component provides the framework for finding, building and sustaining relationships with fundamental research and commercial/academic sector entities. We continually collaborate with other organizations from the broader technology community to build upon and improve our evolving innovation process. ASCEND’s Continuous Learning component embodies both training and knowledge management. To sustain a well-informed staff, we deliberately designed, resourced and actively maintain an innovation knowledge management environment that supports expanding knowledge in technologies, methods and processes. Innovative thinking and collaboration are a natural part of our workday at SuprTEK. Our company culture creates, rewards and sustains a workplace environment that nurtures and fosters innovation from within, which is essential to providing breakthrough value to our customers.